Matcha market stands as one of the primary exemplars of the nutritional transit in the food & beverage sector. The overall industry has witnessed a meteoric rise in the recent years, in terms of demand and sales, with emerging economies prominently swaying the global expansion outlook. The rising consumer awareness toward incorporating food and beverages with a high nutrition quotient, particularly the antioxidants is one of the primary factors influencing matcha market proliferation. The unconventionally harvested matcha, which is a special form of green tea, is renowned for providing a slew of health benefits to the consumers such as enhanced metabolism, cholesterol and sugar control, and detoxification. Endorsed with such nutritional benefits, the F&B industry players have been highly optimistic toward this business growth and have been betting big to explore the opportunities underlying in this space. Asia Pacific matcha industry recorded a demand of USD 800 million in 2017, with a major contribution from China and Japan. The environmental, climatic, and soil feasibility in the region make it a prominent matcha production hub. It is imperative to mention that China is poised to stand as one of the top-notch outsourcing hubs for matcha market players driven by the nation’s favorable regulatory structure. Green tea is touted as one of the most popular products for export in China and accounts for almost 3/4th of the worldwide green tea exportation. In 2010, China accounted for more than 75% of the green tea exported globally. China is also touted as the largest tea producing country in the world, with a record high production of green tea. As per FAO, the total tea production in the nation in 2014 was 2.10 million tons. These statistics vividly hint toward the opportunistic position the country holds for the matcha market players, in terms of outsourcing strategies. Tim Hortons, the largest quick service restaurant chain in Canada, recently unveiled its expansion plans in China. The move basically involved the upgradation of the food and beverage menu with the inclusion of matcha, touted as the most popular ingredient in Asia. Tim Hortons cited the expansion plan as a measure to enhance the customer base in the country with the upgraded menu carrying traditional touch. As per the industry experts, the latest move is a highly thoughtful measure for the company amidst the backdrop where China’s growing middle class population is all the more aware and enthusiastic toward investing in nutritional products. For the record, the company plans to open 1500 new stores in Asia in the coming decade. Powered by a rather dynamic landscape and a strong production and exportation base, China matcha market is projected to contribute enormously to the overall Asia Pacific demand in the medium run. As per a report by Global Market Insights, Inc. APAC matcha market is slated to surpass USD 1.5 billion by 2024. As per Tea Association of the USA, last year, the U.S. tea consumption was recorded at 3.8bn gallons and matcha has been on top of the United States mainstream beverage menu in the recent years. The presence of prominent food chains in tandem with the growing consumer preference toward nutritional edibles has fueled the North America matcha market growth considerably. The regional industry expansion has been prominently characterized by a slew of innovative product launches and R&D investments. One of the popular moves to have influenced the U.S. matcha market dynamics has been the launch of ‘Hustle’ by MatchaBar, a Brooklyn based café renowned for its Matcha based beverages portfolio. For the uninitiated, Hustle is the foremost Matcha energy drink. It offers 120 mg of caffeine and claims to comprise of ingredients which address the health-conscious consumer base. For the record, Matcha Bar was the first matcha cafe in the United States. The company recently also hit the headlines with its partnership with Emmy’s Organics for the launch of Emmy’s Radiant line, matcha cookie. 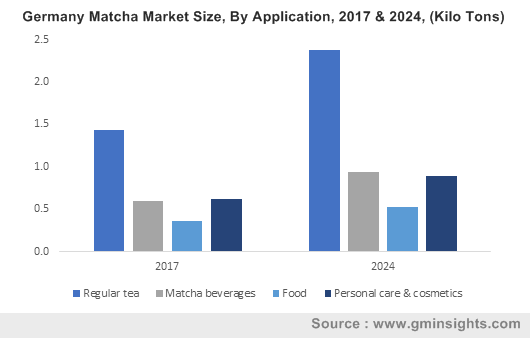 With U.S. at the helm, the overall North America matcha market is anticipated to register an appreciable CAGR of 6% over 2018-2024. Mexico and Canada are some of the other regions poised to register remarkable growth prospects in the ensuing years. While the F&B sector continues to enjoy a prominent contendership in the matcha market, personal care & cosmetics sector is likely to bag an appreciable growth credit for the industry expansion in the coming years. With the shifting trend toward organic cosmetics, the ingredient is certain to witness a sharp uptick in its demand from this sector. In terms of commercialization, matcha market size from personal care and cosmetics application is slated to record a CAGR of 3.5% over 2018-2024.